All transactions are safe and secure with a reliable history in online purchasing behind each of our associates. Buy the Sparkle, you FOOL. SPARKLE! t-shirt to own Twilight clothing and merchandise. Does your boyfriend glitter in the sun like Edward Cullen (Robert Pattinson)? If not, then this is the perfect tee for you. You can try feeding your boyfriend a red apple, which shares a common symbolism with the red apple on Stephenie Meyer's Twilight book cover. The forbidden fruit might help him shine. For now, you'll have to expose his lack of sparkle ability with the design on the left that reads, "Sparkle, you fool. Sparkle!" 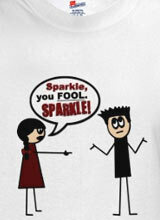 This popular vampire Twilight t-shirt lets everyone know that you want a boyfriend who can sparkle under the sun. In addition to the Sparkle, you FOOL. SPARKLE! tee above, browse the Twilight Clothing Gallery for more apparel like men's and women's clothes, kids shirts or hoodies.